Menu taken from Orangette for the restaurant Delancey in Seattle, Washington. I love this menu. 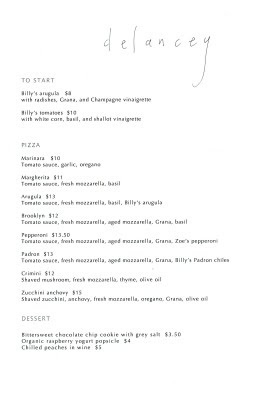 I straightforward names of the pizzas, I like how focused the flavors on the pizza are, and I just absolutely love love love the sound of the desserts. For most sort of European (or to be un-politically correct, white) restaurants, I tend to gauge how good I think the restaurant is based on what the desserts are. I know it sounds so insanely simple, but the idea of a organic raspberry yogurt popsicle makes me swoon along with chilled peaches in wine. I just imagine the pinkness of the raspberries and the freshness of them and having them in a cold popiscle after eating pizza on a summer day sounds pretty more than good to me. Even though I've never been to this restaurant (and probably won't get to it for a bit), I am already in love with it as well. Maybe it's because I have been following it's progress on Orangette and had read how Molly and her husband started with wide-eyed hopes and a nameless empty space into this beautiful, classic, and undoubtedly what will be an insanely popular restaurant. I feel invested in it just by reading about it from start to another start, and I feel insanely happy for these people (almost to the point of weepy if I stare at a picture too long) even though I have never met them and I bet once I get to the restaraunt I'll feel insanely awkward and creepy for having these feelings and stare at (but enjoy) only at my pizza and popsicle (or a different dessert depending on when I'm there). So I'm gonna leave it at that, and if you ever go to Seattle, Delancey yonder! It's quite lovely how you can get so happy by something like this. Makes me happy as well. Aw thank you Mr. Stupor! That is so very nice to hear.